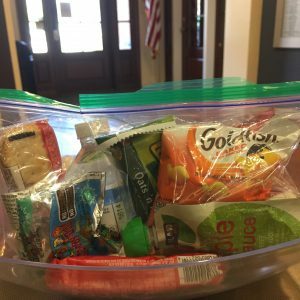 Help our families with grab and go snack bags! Grab and go snack bags are a helpful feature for our families to take with them for a day at the hospital. It’s also a great group project to do with your own family and friends, coworkers or church if you’re looking for a way to support Ronald McDonald House Charities of Alabama. All you need are some sandwich or quart size Ziploc bags and individually wrapped snacks! A breakfast snack bag can include a small juice box or water, a granola bar and an applesauce/fruit pouch. Another popular snack bag combo includes juice, Goldfish crackers and a Rice Krispie treat. Other kid-friendly ideas include fruit snacks, cereal, pretzels, 100 calorie packs, packs of cheese crackers and cookies. Get creative with your combos! But please avoid any snacks containing nuts and choose items that are non-perishable because our families may not have access to a fridge when they’re out for the day. You can drop off the snack bags at our House at 1700 4th Avenue South, Birmingham Alabama 35233. Questions? Contact Director of Family Programming April Dickerson at april.dickerson@rmhca.org or by calling 205-638-7254.